Finished this pair of socks last evening. 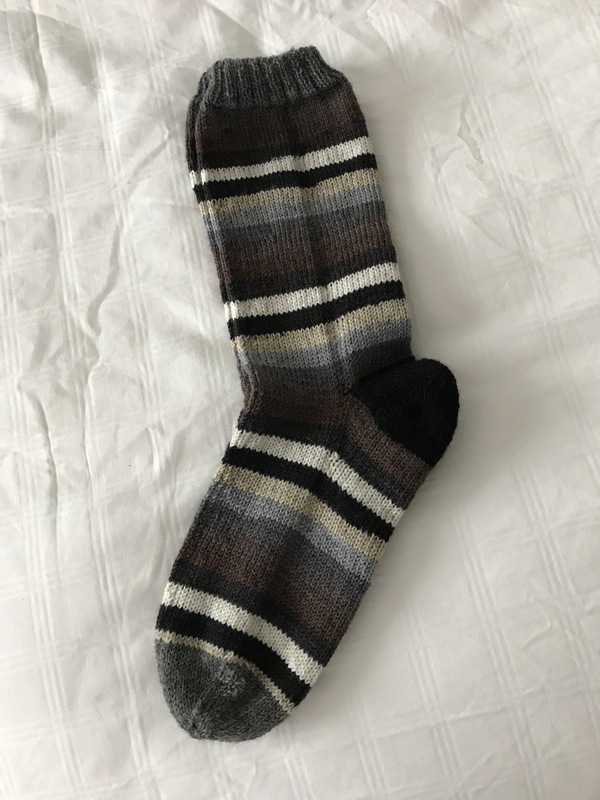 Been working on them for a couple of weeks – a pair of socks (women’s size 7-8) takes me on average 25 hours. I worked on these a bit while I was away. I already had the first sock completed. I was just past the heel on the second when I packed them to take with me. I got the gusset done while I was away. I did most of the finishing of the foot these past two evenings. I enjoyed working with this patterned yarn and the blending colour for cuff, heel, toe was a perfect match – that doesn’t always happen. I started a new pair last evening as soon as these were off the needles. 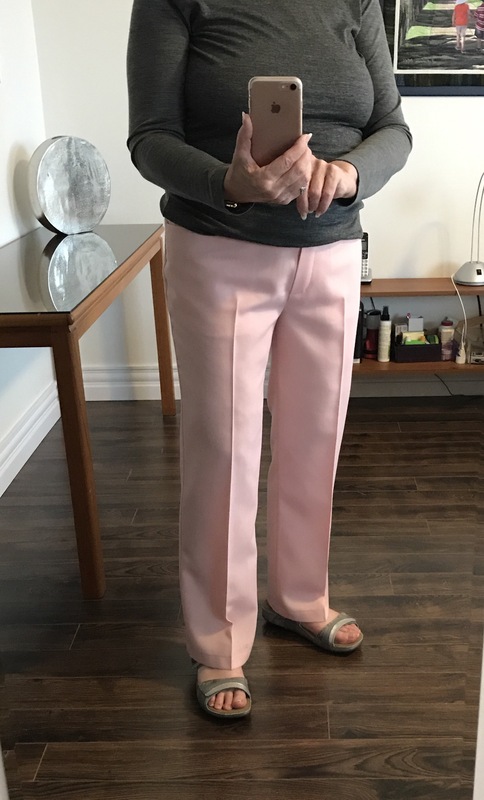 These pants were cut based on the modifications I made to my basic pattern in San Francisco – a small addition to the centre front crotch area, a 3/4″ drop in the front waist, and 1/4″ addition to the side seams because the fabric had no spandex. 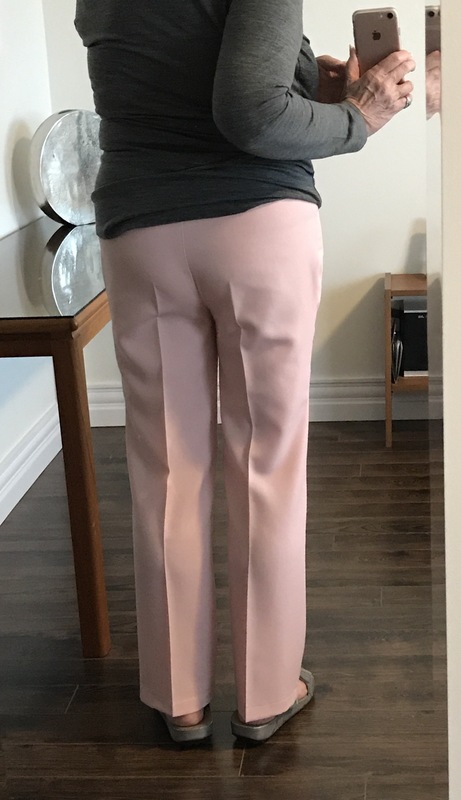 This is a jeans pattern but I thought this wool/polyester fabric was a bit too “dressy” to turn into jeans so I left out all the top stitching, omitted the back pockets, and used a single seam for a neat hem. Have to say they turned out pretty well – although everything that could go wrong did! 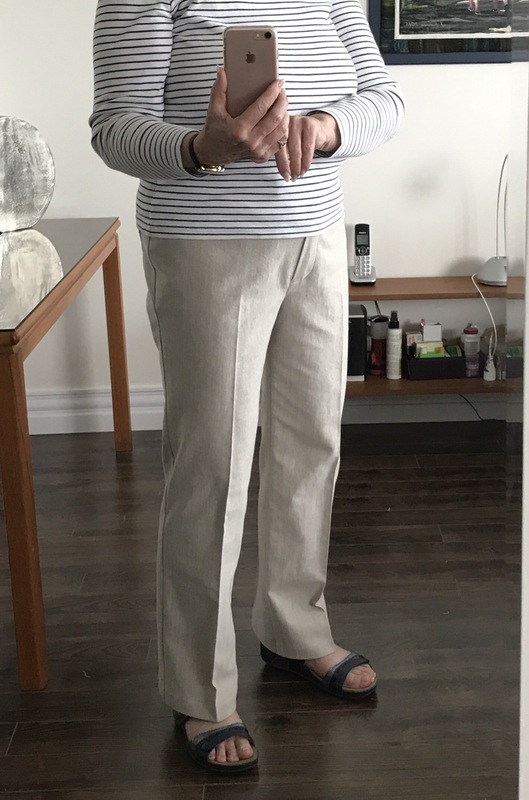 I started by putting the zipper on the wrong side of the fly front, had to redo it, pockets went in fine as did the side seams, but I screwed up threading the embroidery machine and I had to take out a stitched (not yet cut, fortunately) buttonhole not once but twice. After rethreading the machine and doing a practice buttonhole (which I should have done in the first place) the third try was fine. Only then did I cut it open. I’ve just finished cutting pants out of a beige fabric which I will sew tomorrow. 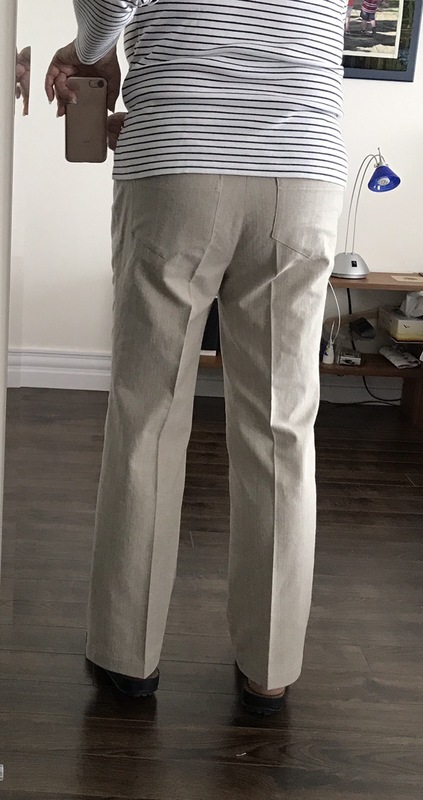 The beige fabric I used for pants in San Francisco turned out to be dreadful – it’s a stretch twill and it now has a permanent stretch across the front where the spandex has failed – very visible. So once these new beige pants (with almost no stretch) are done, the SF pants will get tossed. That’s the same fabric I used for the light and dark blue pants I made earlier in the spring – they’re starting to show the same permanent stress marks across the front so they’ll have to be replaced. This time, I’ll use a cotton twill with no spandex in it. The original fabric wasn’t a cheap fabric, either. So lesson learned – stay away from fabrics with any amount of spandex – they may be intended to provide a comfortable fit with some give but the quality and durability is variable and pants take a good 5-6 hours of work. Too much time for such a limited result! 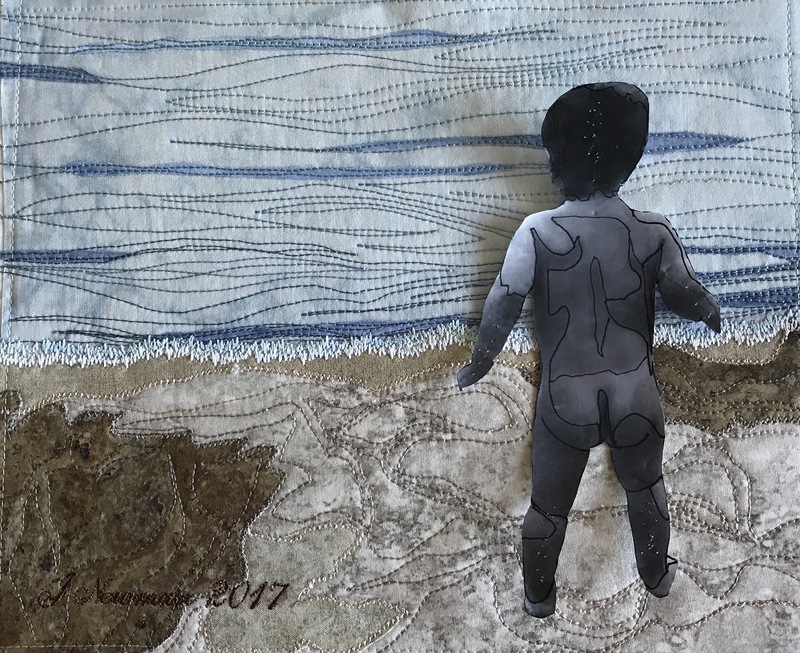 I did a bit of thread painting on the background of this piece yesterday during the Art Quilt Class – I wanted to demonstrate how I double up the rayon thread and use both in a single needle, how I stitch the raw edges using a very narrow blanket stitch, how I freely sew flow lines in the background. 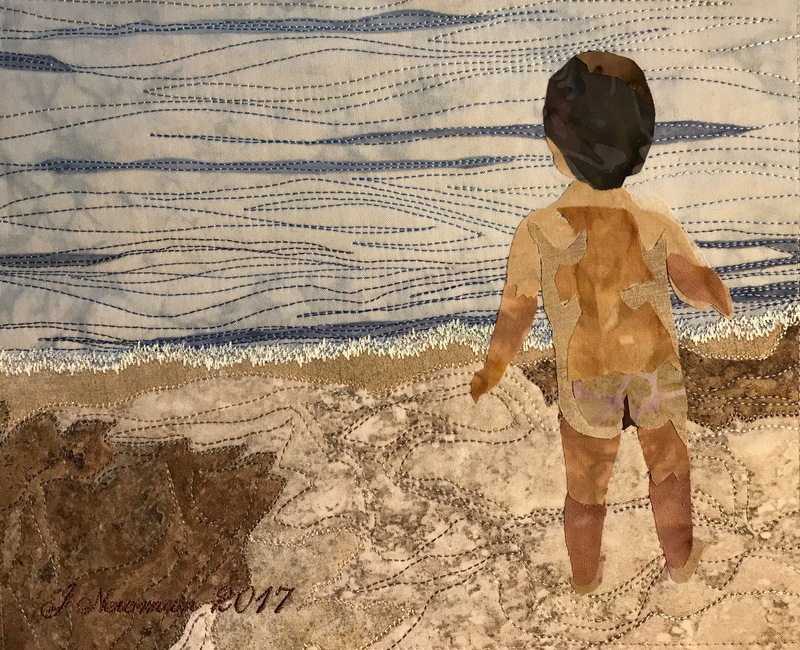 Today, I finished up the background by adding a bit more dark fabric to the water and doing quite a lot of stitching for detail (the thread actually becomes lighter the farther from the foreground it is). As well I did some dense stitching along the water edge to suggest foam. I left the darker edge of wet sand clear of stitching because that sand is always packed densely while it’s still wet. The stitching in the sand is intentionally more random to hint at the irregular detail from many footprints. For the moment Charlie is still a piece of paper. Tomorrow I’m going to work on creating him from 4-6 layers of flesh-toned fabrics from very l light on his right shoulder to very dark at his bum and the backs of his lower legs. I added my signature while I was working at the machine rather than struggle to add it later. I do the embroidery using the metal hoop which allows me to just place the art piece flat and hold it in place with magnets instead of trying to force it into a double pieced hoop – much easier to position the fabric. 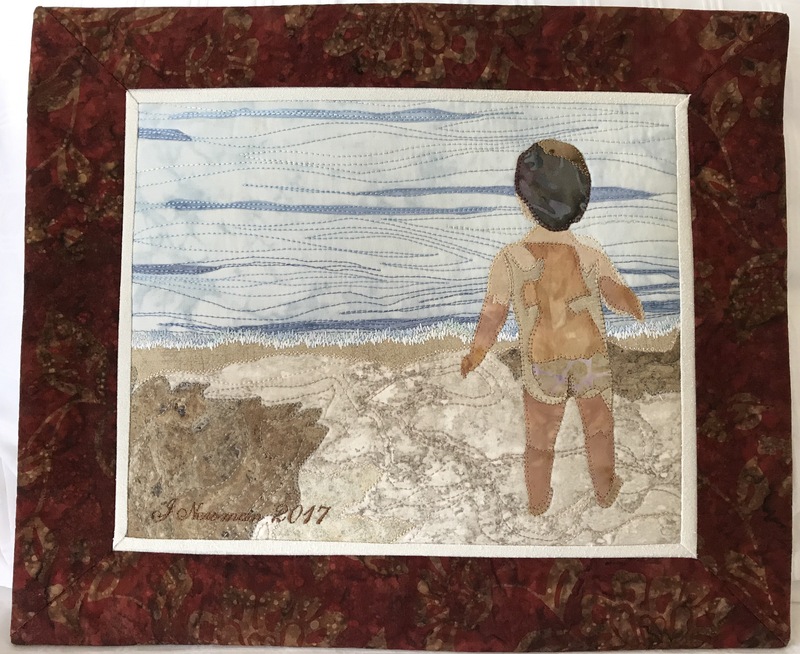 I’m still not sure whether I’ll border this piece or not or whether I’ll use a hidden binding – I’ll see how I feel when the child is assembled and added. Finished dimensions will be approximately 12″ x 10″. 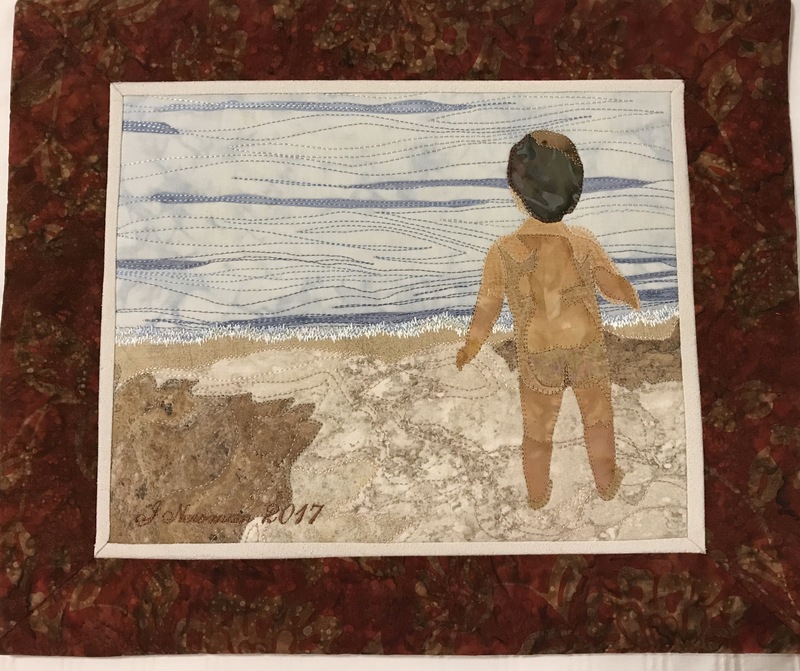 OK, so I didn’t wait until tomorrow – I pieced the child this evening. Didn’t turn out badly at all. Now to edge stitch all the pieces – slowly and carefully. I started these socks just before I went to San Francisco; then I had the carpel tunnel surgery which kept me from knitting for two weeks then only a small amount each day since. 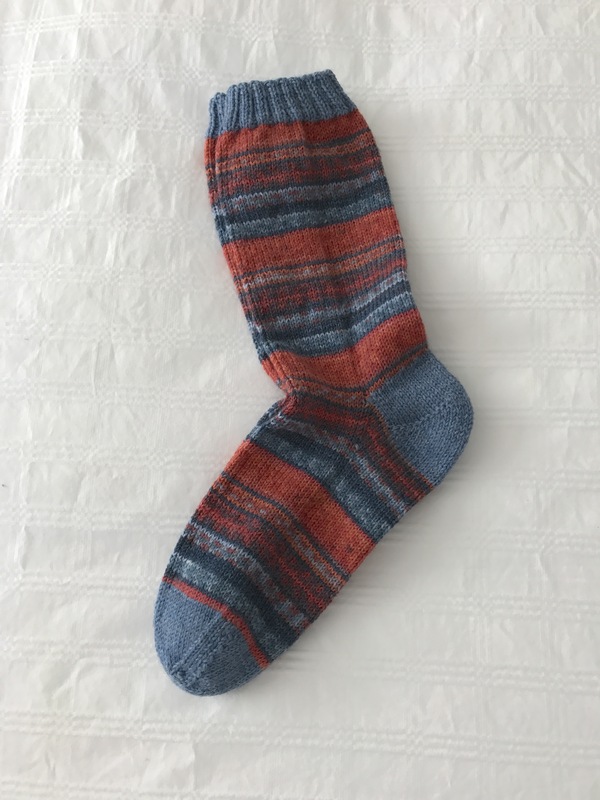 However my hand function is nearly returned to normal – these socks were finished last night and a new pair started.